I gave up making New Year’s resolutions a few years ago. Try as I might, setting a resolution to “get in shape”, “eat healthier”, or “wake up earlier” never turned out to be a great way to actually make those things happen. When I made resolutions, it was as if I was setting myself up for failure — priorities change throughout the year, difficult circumstances pop up, and rarely did I hold onto a resolution until the end of the year (or even want to). When I got sick back in November, I was thrown out of whack for quite a while. But it also made me realize how unbalanced my life was (which is something I knew, but was finally forced to deal with). Balance is something I think few of us ever really achieve in our lives, but is an area I want to focus on growing in this year (in the physical sense too!). I found a quote about balance that sums up my intention with this word: “Balance is not something you find. It’s something you create.” – Jana Kingsford. “I have come that they may have life, and have it to the full.” – John 10:10. I don’t want to just exist. I want to live. It can be easy to float along from day to day, engaging in the same 9-5 grind, without really getting the chance to enjoy life. You can’t just let life happen to you if you want to get out of your routine. Sure, I love routines, but I also have goals I want to accomplish that take me outside my habit of just going wherever life takes me. I want to be intentional about getting the most I can out of life. We were created to live, not just exist. When I used to think of someone who was detached, I thought of someone who was cold and standoffish. But the kind of detachment I am talking about has to do with creating a healthy relationship with this world. It’s about realizing that life is bigger than you and your wants and needs. This is one of the biggest concepts that has stuck out to me in my yoga training (commonly referred to as nonattachment in yoga philosophy). I also believe detachment is echoed in Christianity when Jesus urges to be in the world but not of it. “Detachment is not that you should own nothing. But that nothing should own you.” – Ali ibn Abi Talib. What areas do you want to grow in in 2016? 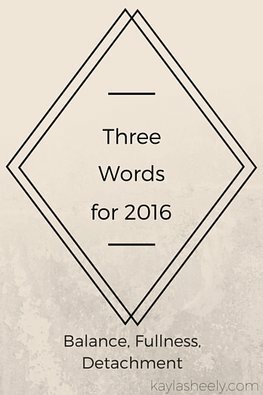 I’d love to hear about your intentions for the new year!